We’ve been busy in the WaHiki kitchen come up with some delicious and nutritious recipes for you to wow loved ones. These Coconut and Vanilla Custard Cherry Tarts are free of gluten, dairy, grains and low in sugar. They are delicious, simple to make and easily adaptable to use any seasonal fruit or filling. 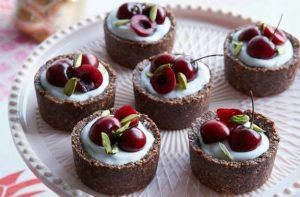 Note – These tarts can be made up to three days ahead of time and stored in an airtight container. If you want a more simple dessert, you could opt for just WaHiki coconut ice cream as the filling instead of this coconut vanilla custard. If cherries are not available you could use any other seasonal fruit such as strawberries. This tart mixture will make 12-15 mini tarts, or 6-8 medium sized tarts. Place all base ingredients in a food processor and blitz until well combined and crumbly. The mixture should hold together well when pinched together. If a little wet, you can add 1 Tablespoon of coconut flour to the mixture. Lightly grease and line the base and sides of a mini muffin pan, or muffin tin depending on the size of your tarts. Press mixture down firmly and evenly with your fingers. Bake for 10 minutes until lightly browned, then set aside to cool completely in the fridge. Bring 1½ cups of the WaHiki coconut ice cream to a boil in a saucepan along with the scraped vanilla bean. In a small bowl mix the tapioca flour and salt with the remaining softened 1/2 cup WaHiki coconut ice cream until dissolved and set aside. In a small bowl whisk the egg yolks then add some of the hot WaHiki coconut ice cream mix to the bowl to temper the eggs and pour the egg mixture into the saucepan – continue whisking to combine. Add the ice cream mixture to the pan and stir constantly until it thickens and starts to simmer. Do not boil. Remove from the heat, cover with baking paper or plastic wrap so it doesn’t form a skin, let cool to room temperature and refrigerate until cold or use warm immediately. Freeze dried raspberry, strawberry or blackcurrant powder for sprinkling. To assemble the tarts, spoon the coconut custard mixture into the tart shells. Garnish each tart with one cherry and WaHiki coconut ice cream. Sprinkle all the tarts with freeze dried fruit powder. Serve with love.